So my pet Aloe Vera has some history. I took an offspring with me when I got married in 1978 and moved to England. Ever since then, our friend "Hello Vera" as my ex-husband used to call her, has been used to treat burns from cooking, oil splashes, sun burn (absolutely extraordinary! ), nappy rash, insect bites, allergic reactions, eczema, wounds on the pets, and one particular incident which I thought was amazing, when I was working with molten pewter and actually managed to pour liquid molten pewter over my hand, where it sizzled briefly before immediately setting into hard shiny silver metal - with my skin imprinted underneath when I lifted it off. I got a leaf from the plant (after asking it for permission, obviously), put it on the ferocious burn and it literally healed overnight, didn't hurt, didn't blister, didn't leave the trace of a scar. Before that, I thought Aloe Vera was handy. After the pewter incident, my esteem for my personal ready-to-use pharmacy in a flowerpot grew immeasurably. 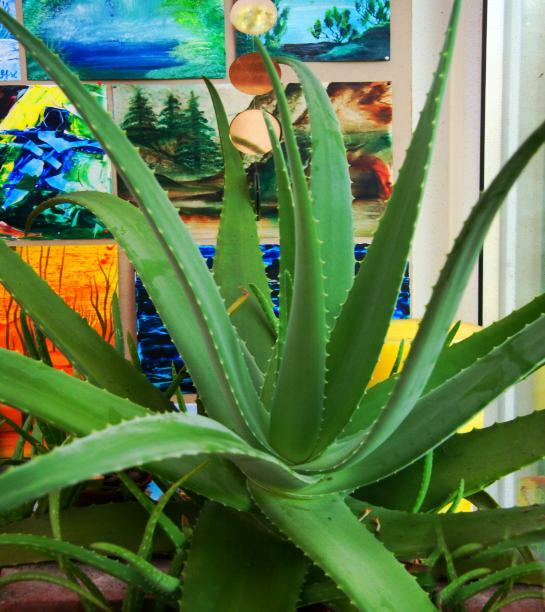 After every incident of help and healing, I thanked my Aloe Vera plant most gratefully and also taught the children to treat it with respect. I would put forth the premise that now we have three things happening here. At the baseline, we have the scientifically proven actual physical components of this most remarkable plant, which has 150 different and beneficial ingredients of all kinds for real in its handy jelly-water package. You really don't need to "believe" in anything at all to get the benefits of that. Widen the viewpoint, and you get this "golden line of healing" passed down the generations through the mother's line as each woman takes an offspring upon setting up home of her own and she becomes the healer of the household then, with the plant bringing with it the resonance of all those small healings across the decades in its very structure. 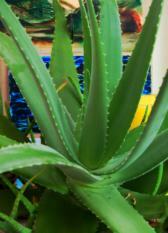 But then, we have MY personal Aloe Vera plant. It's not really a plant, it's like a big tentacle being that sits in the corner of the kitchen. My Aloe Vera is HUGE. This picture doesn't do it justice, but the images in the background are each one A4 in size, so that gives you some idea. This plant being is vibrant and alive with all the energy of gratitude and expectation of healing that we've all poured into it for all those YEARS of faithful service. This plant has truly *become* a MAGIC PLANT, something that has the power to heal across the levels and the layers just the same, from the physical to the metaphysical and via the ancestors right up into the spirit world. 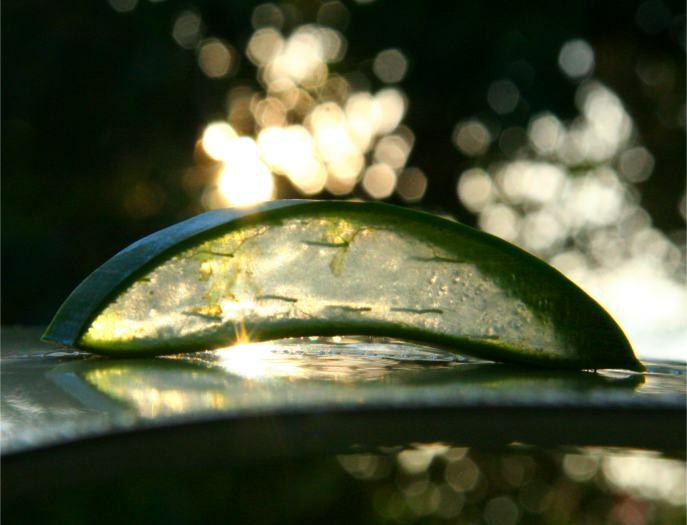 The Aloe Vera has become imbued with healing magic, and this has become stronger as the years go by. Earlier this month, I took a big chunk of flesh out of my thigh with a carving tool when I lost concentration and the very sharp chisel slipped. For over two weeks, whilst being treated with Iodine and sterilised wound dressings, this deep wound showed no signs whatsoever of wanting to heal or stop being infected, in spite of even a course of antibiotics being administered. Finally I saw the light, threw the Iodine and the bandages away and just used Aloe Vera on the wound every time it gave an indication that it wanted treatment, by hurting, throbbing or itching. Within the week, all the swelling was gone. The discomfort was gone. The wound wasn't infected anymore and was starting to close. Now, it's no larger than a Fifty Pence piece and covered by a healthy looking crust which will soon be gone as well. What was I thinking to wait so long? I can only shake my head and say, well, this modern medicine thing is like brain washing. Once you're on that bandwagon of hospital appointments and A&E visits, you sort of go with the programme and you don't think clearly anymore. I guess that's what happened to me. But still, I did see the light, turned to my trusty friend of healing, and once again, it pulled off an immediate recovery in conjunction with my own body's self healing systems. Oh, but there are many. Us modern magicians have to look out and not be too singlemindedly "scientific" about the healing properties of plants. There is more to healing, to true healing, than chemicals. There are other levels and layers, many of which we don't know anything about yet. These are vitally important to true healing in every way, and it is difficult to estimate the especially long term effects of these things. Some of these properties come with the plant, absolutely. But some of properties come about because WE interact with the plant, and WE imbue it with further healing qualities - and that's where magic comes in. A rose is just a rose, but a rose in the hands of a magician becomes much more than "just" a rose. It becomes a powerful ingredient for a spell that actually changes reality. A rose bush in your garden can become a guardian, a fountain of light, love and healing and so much more besides. This is something that the witches, shamans and magicians of old took for granted. They KNEW this, never doubted it, and never questioned it. For us "modern" folk, it is a different story, and we do have to remember that we co-create the magic of any herb, plant, essence in every way. Some plants make it easier than others, like my friendly creature with the many tentacles who so stoutly assists all my family's healings. With others, it isn't quite so obvious - but it's available, and herbal healing magic absolutely exists, we just need to get our modern heads around it in the right way. And here's a passing thought. The great Creative Order created this plant which is a pharmacy by virtue of pure existence. It is the perfectly packaged, always fresh, always sterile supply of all these different healing components, made mostly from sunlight and a bit of water. Not only that, it is EDIBLE to us and many other creatures besides us. Isn't the world just one fascinating, remarkable place?